Eye Magazine | Opinion | Have you ever really looked at this poster? Have you ever really looked at this poster? A critical design history should explore the relationship of form, content and production, argues the author of a new concise history. 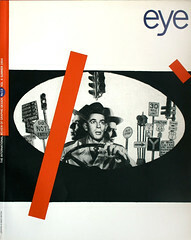 In 1961 the Swiss magazine New Graphic Design published an account of pioneering Dutch work of the 1920s and 1930s. For me and some of my colleagues in the Design department at what was then the London School of Printing and Graphic Arts, the article provided an insight into what graphic design is and what it might be. In 1964, at the Icograda conference in Zurich, I was introduced to the author of the article, Paul Schuitema. He found our interest in work done 30 years earlier perverse and disturbing. The past was over. There had been a world war. Now we lived in an atomic age, in a different world, with different problems. To Schuitema, being seen as a pioneer of the early days of graphic design was an embarrassment. Yet in his studio he kept the complete exhibition, mounted on boards, of the 1931 Amsterdam show ‘Ring neuer Werbegestalter’. If Schuitema belonged to the first generation of graphic designers, then he must be at the beginning of a history. Yet in Philip Meggs’ 500-page A History of Graphic Design (1983) he appears on page 356, while in the best-known history of the subject before Meggs, the Swiss designer Josef Müller-Brockmann’s A History of Visual Communication (1971), his work is discussed more than two-thirds of the way through. Of course, both books have an elaborate pre-history. Müller-Brockmann’s subtitle is frank about its scope: ‘From the Dawn of Barter in the Ancient World to the Visualized Conception of Today’. But a history of visual communication is not a history of design, even if the story is presented as an inexorable development towards graphic design. A glance at histories by non-designers, such as Lancelot Hogben’s From Cave Painting to Comic Strip (1949), exposes the problem. It is like saying that building is architecture; that a history of one is a history of the other. My own Graphic Design: A Concise History tries to separate graphics from design. Graphic design becomes ‘what a graphic designer does’. The result is a specific form of visual communication: not only is the activity called design, but design is the outcome and expression of what a designer does. Graphics before graphic design – the forms of the alphabet, symbols and signs with understood meaning like the arrow – become part of a general pre-history. And this raw material in turn has its own pre-history, which it shares with the fine arts: two-dimensional formal techniques (tone, line and perspective) and such graphic devices as silhouette and positive-negative reversal. Before graphic designers there were craftsmen who made printing in the way they thought printing should look. Technology has transformed the way we make and see images and the way they are reproduced: first through photography and then through computers. The history of graphic design is the history of the designers taking control of the craftsman’s process – a trend that has continued until, with the Macintosh, it is almost total. If our concern is with the control of the process, then the pre-history of graphic design can begin at the end of the nineteenth century, with the colour poster. This is convenient because it is an instance in which we cannot avoid discussing the connections between the social circumstances in which the works are produced, the prevailing aesthetic and stylistic influences, and the means and techniques of their production. These, and later the relationship of text and image in a structure to convey an idea, are the underlying concerns of A Concise History, which uses these considerations as a basis of criticism of individual works. As with a coat that fits and hangs well, we may recognise and admire the choice of cloth, but only by unpicking the stitches can we see how its form depends on the way it has been cut, sewn, lined and interfaced. This unpicking assumes that the process of design involves a series of more or less conscious decisions, and these can be identified by a scrutiny of the work. What work? First and most obviously, that which has survived. Often this is not original artefacts, but as what was reproduced – particularly in professional journals and yearbooks – soon after its appearance. Such survivals are often fortuitous, dependent on the designers’ energy in self-promotion and their contacts with design journalism. Once reproduced, works survive, design histories give them a third life, and familiarity breeds acceptance into a canon. Conspicuous as an example of this process is the work of the expatriate American poster artist and illustrator Edward McKnight Kauffer. In England his status was assured by his authorship of The Art of the Poster (1924). His career in the 1920s and 1930s was recorded in the pages of the monthly Commercial Art, which acclaimed each new design. A retrospective of his work was held at the Museum of Modern Art in 1937; another, a year after his death in America in 1954, at the Victoria & Albert Museum. A full biographical study was published in 1974. A look at Kauffer’s career takes us to the central issue of graphic design history. In a critical torpor, a vacuum, such work has an assured place. But the subject of critical discussion of a design is the relationship of the message to the formal content and its organisation, and of these to the means of their production. To compare Kauffer with Cassandre in this light reveals that in Kauffer’s designs there is little effective connection between the elements of the message and their graphic expression. We are left with the style, the crass adaptations of cubistic mannerisms, customising their message with snobbish vulgarity. The reader may infer that this flattered his clients’ conceit in their modern outlook, aesthetically and socially. Cassandre had similar clients, employed a graphic language with the same roots in Cubism, yet his posters are formal concepts, derived from the name of the product or slogan, that fuse the image lettering and technique into a geometric construction. Cassandre’s ‘Étoile du Nord’ railway poster has become a paradigm of the Good Design to which we all aspire. But do we ever really look at this poster? If designing is about deciding, and good design about good decisions, then critical history can illuminate its exemplary character: the concentrated intelligence in its expression of the north star in word and image; in its mathematical structure; in its use of colour and the construction of its lettering. It is also a work of its time: demonstrably pre-photographic in its cubistic technique, its tonal gradation achieved by splatter and its colour by selected, not process colours. The detailed discussion of the individual graphic artefacts is the simplest way to help us to understand how graphic design was carried out in a particular period. The criterion for the choice of work should be the importance of what it can be made to reveal. This does not allow for some of the many shortcomings of graphic design history recited by Bridget Wilkins (Eye no. 6 vol. 2): its failure to include ‘the motives and ambitions of the commissioning agent’ and ‘the way these communications are received by their audiences’. But this is not the central aim of design history. Where facts can be found, they should be brought to bear on the discussion of a work, particularly those which shed light on the designer’s intentions. But as designers know, post hoc analyses (case studies) of individual jobs are not necessarily intended to present a factual account, but are part of a public relations initiative; they are as useful as the general staff’s report on a battle is to military historians. Discussing work with the designers who made it is productive when it focuses on the work itself. The rest is conjecture. By contrast with architecture, whose ideological development in the Modern Movement it has paralleled, graphic design history has attracted little academic or even journalistic interest. Gestalt psychology, mathematical theories of communication and information, semiology, the post-modern concept of a building as a conglomerate of signs, Structuralist interest in images – all might have shed more light on visual communication. Architects have been important polemicists, while French filmmakers, particularly those of the French nouvelle vague, have helped to establish an intellectual foundation for their work. Many graphic designers have written too, but we have paid them less attention. Important texts that lie hidden in trade magazines need to be collected. Will Burtin and Ladislav Sutnar’s arguments for information design should be reprinted. Texts on European authors should be translated into English; as has been shown in the case of Jan Tschichold, they have lasting relevance.